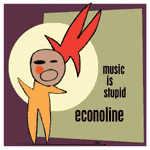 Econline are indie music of the really old school. We're talking pre-grunge English indie guitar music here, the vibrant, but understated scene that boasted such names as Swervedriver and God Machine and many more I can barely remember, with influences drawn somewhat from US bands like Pavement. So, that means there's lots of guitars that don't necessarily match the vocals, strong rhythms, lots of noisy melody and intense emotions. And Ecoline do it fairly well, Gabriella Zappia's voice is frenetic and insistent, sometimes bringing James Dean Bradfield from the earliest days of the Manics to mind, and the songs are short and sharp. These days, adjectives like emo get attached to stuff like this, as if new terms are really needed for old style. Maybe they are, to a degree, but it doesn't change the fact that Ecoline play music that sounds over 10 years old. That's not necessarily a bad thing, though, they do have their own sound and don't go out of their way to sound like anyone, but, for me anyway, this is a blast from the past and not really anything to get excited about.